Note: directors’ subordinated loans may be treated as part of net worth. Personal guarantees pledged by principal(s) of the business for each loan. Further security required for larger loans at our discretion. 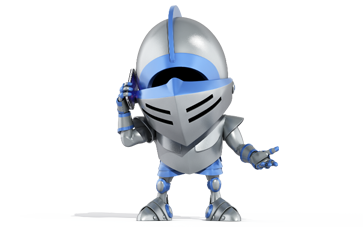 You can currently get loans from £250,000 to £1 million through FundingKnight. Our loan terms range from 6 months to 5 years. Before the loan auction (see below), our credit analysts will assess your opportunity – examining the overall risk, purpose and presentational aspects. If your opportunity is approved, we will agree a maximum interest rate with you (known as the ‘reserve rate’). Based upon the information you share and our discussions with you, we will also assign a ‘shield rating’ to your loan (from 2 to 5). This will indicate the perceived risk to our investors when your loan goes to auction. The stronger your application, the higher your shield rating will be, which can help bring your interest rate down. During the loan auction (which typically lasts 7 days) our investors bid to fund your loan at the interest rate they’re willing to offer. The bids with the lowest rates win. If you have a high shield rating and investors are keen on your business, their bids will become more competitive – and as the borrower, you pay the aggregated average of the successful bids. To date, our interest rates for Business loans have ranged between 8.75% and 12%. Our investors will spend a lot of time researching your business as well as the others listed on our website. The people who invest in your loan will be placing their trust in you – and expecting to get their money back. During a loan auction, investors who bid with the lowest interest rates will win the opportunity to fund your loan. If the loan isn’t completely filled by these bids, our underwriters will make up the remaining amount of the funds – which provides you with a degree of certainty once your funding auction starts. We also charge a repayment fee, calculated at 1% of each payment, which is added to each loan payment. Our average turnaround time, from initial application to money in your bank account, is one month. If you have all of your documents prepared and ready for review, it can be much faster. You’ll receive your money when the loan auction finishes – typically the funds will reach your account on the same day. Working capital: purchase of stock, supporting your operating cycle, international trade. Capital expenditure: purchase of plant and machinery, office equipment or improvement/refurbishment of property. Project finance: strategic expansion, acquisitions, share buy-backs, research & development. You initially outline the term of the loan you desire; it can be anywhere from 6 months to 5 years. Your credit analyst will discuss this with you further as we progress your application. Typically, the shorter your term, the lower your interest rate – but the key thing is to match the term of the loan with the purpose of the funding and what the cash flow of your business can bear. If your application passes the first core requirements, we will then ask for some more supporting information and help guide you through the rest of the application process. Once you have provided us with the various items we need to review, your dedicated credit analyst will analyse this information and arrange a call with you to discuss your application and your business. If your application is approved, we will send you a loan offer, along with all relevant security documentation. The loan offer document will include your agreed maximum interest rate (called your ‘reserve rate’), plus any other terms or conditions that apply specifically to your loan. Once you’ve signed and returned this documentation, you’re ready to go to auction. Your management accounts give us a picture of your most recent and current financial position. We understand that these accounts are usually generated internally – and therefore are not independent. However providing this information demonstrates to FundingKnight the internal financial controls you have and illustrates how your company is trading along with its subsequent balance sheet movements. We now know where your business has been – and your cash flow forecast will tell us where you believe your business is going. This information helps us understand how your company can finance the repayments, and also shows the anticipated impact of the loan on your business. We are always impressed with high quality cash management and financial controls because they show the financial understanding and professionalism of the company’s key managers. We need to know about the assets or wealth that sit behind any proposed guarantor(s). Note: this, in isolation, doesn’t dictate the outcome of your application – but under normal circumstances we do require at least one of the guarantors to be a UK homeowner. Our analysis of your opportunity also focuses on the individuals that own and operate your business. Our investors aren’t just interested in the numbers. They’ll also be looking to get a clear understanding of what your company does, the key personnel that drive the business, and how the additional finance will help you take the next steps. This is a fantastic opportunity for you to talk directly to potential investors, and share your enthusiasm and ambition for the business. We need to know the names and addresses of your directors and beneficial owners to carry out our AML (Anti Money Laundering) and credit checking responsibilities. We require these details for all directors and any shareholders with 20% or more of the equity in your business. Finally, our credit analyst will also carry out a telephone interview with you and ask you to put together a loan ‘pitch’ to help convince investors to put their faith (and their money) in your business. What happens in the telephone interview? We can learn a lot about your business through the paperwork, but nothing beats speaking to you in person. This is a crucial part of our assessment process, and a mark of the quality of service that we give to businesses. During the phone interview, our credit analyst will follow up on any questions that have arisen from our review of your financial documents. They’ll also ask you more about your management team to get a greater understanding of their knowledge, depth and experience. Above all, they’ll have a chance to really understand your business, and start to build an honest and positive relationship, which will hopefully benefit you for many years to come. A description and brief background of your business. Key areas to articulate include the markets you occupy, history, performance, key customers & suppliers (if not commercially sensitive), accreditations, etc. – as well as any other salient info for investors. A brief background of the directors/owners (your experience, etc.) and your management team. Focus here on key individuals, their responsibilities and importance, and also articulate any group structures that may be of benefit to investors (especially where related debtors/creditors exist). This information helps with encouraging lenders to bid. Focus here on the specific use of this cash, and what it will enable the business to achieve moving forward in terms of enhanced efficiencies, profitability, or balance sheet liquidity. Focus here on your payment history across all/any previous debt obligations, amount of funds personally invested into the business by owners, the trajectory of performance due to specific contracts or opportunities and other areas. Once you’ve signed the loan offer and returned all of the documentation, your loan is approved and ready to go to live auction. If your loan isn’t completely filled by these bids, our underwriters will make up the remaining amount of funds. In other words, you will always get your money. The only factor not set in stone is the interest rate you’ll pay. While you will have agreed on a maximum interest rate before the auction, competitive bidding from investors could push down your interest rate and get you a better deal. You will begin to make repayments one month from drawdown. This means there will be a fixed amount of capital and interest to pay to FundingKnight each month, which we will then allocate to each of your investors. Under certain circumstances we can agree a payment holiday, which allows you to wait a few months before starting to pay your loan back. This can be particularly helpful if the loan is for a project that won’t generate revenue in its early stages. Please note though that interest will start to accrue from the day the loan is drawndown – so a payment holiday will increase the overall cost of your loan. If you are encountering difficulties in making a repayment, the first thing you should do is call FundingKnight to discuss the issue. With strong and coherent communication, all parties can agree an appropriate course of action and convey this accordingly to your investors. Failure to communicate in the event of default or missed repayment would mean that FundingKnight would need to move straight to formal, legal debt recovery proceedings against both the business and the loan guarantors. If you go out of business, we will work with the administrator, or appropriate legal entity, to reclaim as much as possible. In some cases, we may appoint a debt collector. Simply sign in to your FundingKnight account and fill out an application. Alternatively, you can contact your dedicated credit analyst or a member of our team and we’ll discuss how we can help.